The Seven are still struggling with their efforts to dominate the galaxy. While the conflict escalates, the leaders receive discomforting reports from the newly discovered sectors, from Sigma Hydrae to Theta Ophiuchi. The systems previously thought to be empty are suddenly swarming with Ancients â€“ whole worlds of them, with ship capabilities way beyond anything seen before. They are not willing to negotiate. The former adversaries need to find allies among themselves to face the rising threat. At the same time new factions are trying to get a foothold on the galaxy and even overthrow the Seven. The times are interesting indeed. The Ancients are rising. Will your civilization rise above the others and emerge victorious? 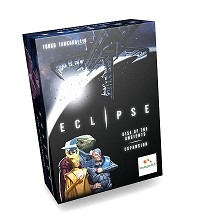 Other products in the "Eclipse" series.